Project Learning Tree is an award-winning environmental education program designed for teachers and other educators, parents, and community leaders working with youth from preschool through grade 12. Using trees and forests as windows on the world, this hands-on, interdisciplinary, award-winning program teaches students how to investigate, interact with, and develop skills for how to think, not what to think, about forests and the broader environment. Why become a Project Learning Tree Educator? Project Learning Tree is a great way to incorporate environmental education into your existing lesson plan in many subjects areas including science, math, social studies, and even PE. Innovative Teacher-Leaders utilize these comprehensive guides full of activities to create dynamic, interactive, and engaging learning opportunities that can be designed for either indoor or outdoor learning or a combination of both! Classroom teachers, environmental educators working in parks or nature centers, child care providers, Scout leaders, and more can benefit from the high-quality, easy-to-use materials, the professional development in environmental educaton, and an extensive state and national network of support. Contact your PLT State Coordinator at plt@maeoe.org to learn more about or to schedule in-person workshops in your area, or work with him or her to plan one for your unique setting! New: MAEOE offers a hybrid-training utilizing a facilitator-led, group model to support the E-Unit materials. Contact us today to learn more about this. What Courses and Guides are offered through PLT? Charting Diversity. Birds and Worms. Pollution Search. These are some of the 96 hands-on interdisciplinary activities found in Project Learning Tree’s PreK-8 Environmental Education Activity Guide. Topics include forests, wildlife, water, air, energy, waste, climate change, invasive species, community planning, and more. Each activity is tailored to specific grade levels and learning objectives. The materials provide educators the tools they need to bring the environment into their classrooms — and their students into the environment. Perhaps more than any other environmental issue, the topic of climate change challenges science teachers to accurately convey data, reveal assumptions, and engage critical-thinking skills. Designed for 6th-8th grade teachers, Carbon & Climate provides activities and resources to help educators meet these challenges, introducing students to some of the complex issues involved in climate change. Hands-On Activities: Get students excited about science through hands-on activities, rather than simply memorizing facts. Meet NGSS Standards: The e-units are constructed around targeted performance expectations of the Next Generation Science Standards (NGSS). Flexible Curriculum: Use activities as stand-alone, or move through all e-unit activities from beginning to end. MAEOE offers hybrid training opportunities incorporating this curriculum and it's e-materials with the additional benefit of a trained facilitator to make the learning truly dynamic. 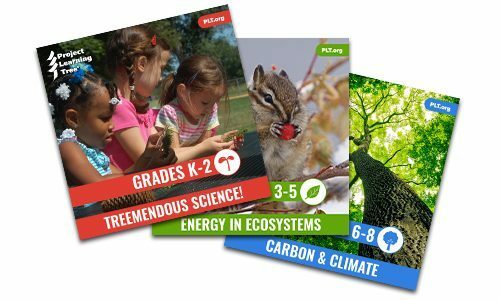 For K-2 teachers, Treemendous Science! helps young children explore, experience, and collect data to understand how trees grow, the roles trees play in ecological systems, and how humans and trees interact. MAEOE offers hybrid training opportunities incorporating this curriculum and it's e-materials with the additional benefit of a trained facilitator to make the professional development learning opportunity truly dynamic. Designed for 3rd-5th grade teachers, the Energy in Ecosystems e-unit investigates ways in which organisms depend on each other to survive and thrive. Students focus on forests (one of the largest and most complex types of ecosystems) and come to understand some of the interactions present in all ecosystems. In doing so, they learn to appreciate the natural systems on which we depend and begin to widen their circle of compassion to include all of nature.